I often get asked why I selected the product lines I carry at SkinSense so here is a brief summary of the lines we stock. Guinot is a skin care line that has been privately owned and operated for over half a century. With the cache of French luxury and the advantages of time tested formulas and modern science, the Guinot products offer the best possible solutions to everyone’s skin care problems and needs. I have always used this line in my business because of the great results I have seen on my clients’ skins over the three decades I have owned SkinSense. Each formula takes sensitivity into account which is so vital in today’s stressed world where acne, rosacea, and even pigmentation can be triggered by our fast paced lives. There is also a blend of essential oils, super moisturizing elements like hyaluronic acid, high powered proteins like collagen and elastin and super actives like ATP that coupled with the specialized Guinot facials that we also offer can make the skin act years younger than its chronological age. 302 Skincare is 100% organic and contains a powerful avocado molecule that messages the cell receptors to get busy. Also great for sensitive skins, the formulas are uncomplicated and extremely gentle. Clients love the price point of this line. We use PCA skin care to target very specific issues like acne, rosacea and hyperpigmentation. We find the formulas blend very well with everything else we stock and once again the price point is very favorable. Even though the products are tough on acne they re-balance and correct the skin without causing irritation. This line is ideal for our teenage clientele. Glominerals offers a wide selection of mineral cosmetics that we color match to each client’s skin. We also carry a select number of Glominerals skin care products to target aging, hydration and adult acne. Circadia is a scientifically advanced line that like Guinot offers salon protocols as well as high-end home care products. We use these items to target the toughest skin issues like advanced or premature aging, melasma and severe wrinkling. Finally we retail a wide selection of essential oils from E3 and lavender oils and skin and body care products from Matanzas Creek. This AWARD WINNING SPF 30 formula is both a moisturizer and sunscreen which contains anti-oxidants and broad-spectrum UVA / UVB protection. Created with lupus patients in mind, this formula suits all skin conditions and should be worn daily. 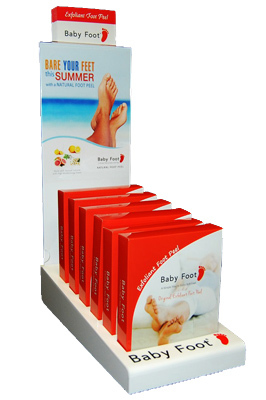 Baby Foot is an innovative foot care product that will make your feet as smooth and soft as a baby’s “you know what!” This unique formula of 17 types of botanical extracts will allow your feet to exfoliate naturally. The main ingredients are fruit acids collectively referred to as Lactic, Glycolic, Apple, Citric and Citrus. This one hour at home treatment is easy to use, effective, effortless and after 5-7 days the dead skin cells will start to peel off and the skin on your feet will be Summer ready. We continually re-evaluate our inventory and before adding any product test it thoroughly to ensure safety and results. We are proud to represent all these product lines.